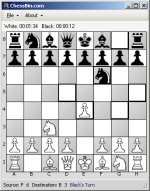 Graphical Representation of the Chess Board that allows you to move pieces around the board to only valid positions. Board Square Class containing code that represents each squares on the Chess Board. Board Representation Class containing all the code necessary to store the positions of each chess piece. Chess Piece Class containing all the code needed to represent a Chess Piece, including Valid Moves, En Passant moves and Chess Piece Values. Chess Piece Moves Class containing code that calculates all moves for every chess piece on the board. Chess Piece Valid Moves Class containing code that examines the current chess board and calculates only valid moves for each position. Using this starter kit you can focus on developing your own Move Search and Move Evaluation code that will allow the computer to play against you. The Chess Game Starter Kit is free, even for commercial use; however a link back to ChessBin.com is certainly appreciated.